The three-bedroom home is connected to a dock house, garage, and vegetable garden by a network of wood walkways and decks. The Japanese-style bathroom, which is clad in teak, features a matching tub and sink by Bath in Wood. 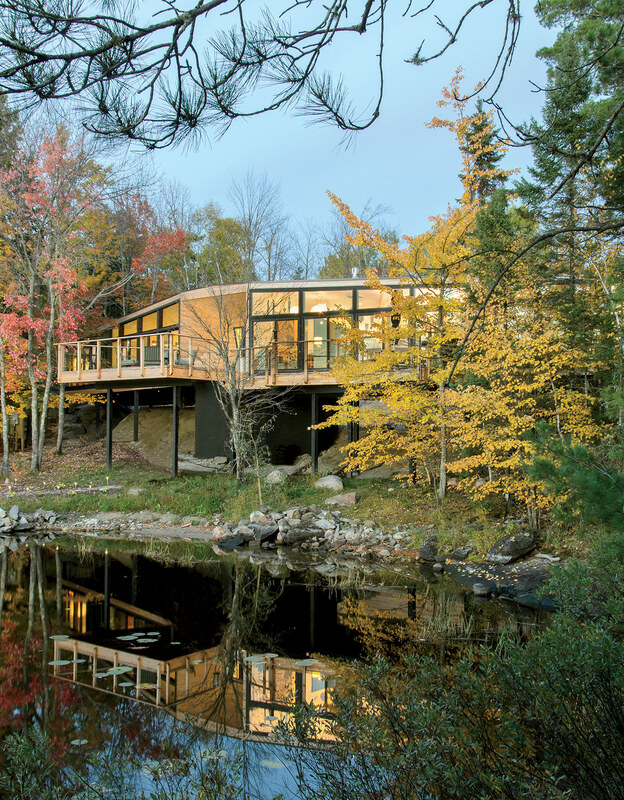 On Rainy Lake in Ontario, a cedar-clad cottage extends almost naturally from an outcrop of volcanic rock. Like organisms that have adapted to a harsh climate, the home’s two volumes bend with the glacier-formed ridge, their steel foundation bolted firmly to the basalt. One would hardly suspect the home was born on a factory floor roughly 400 miles away. For Charlie Lazor, the Minneapolis architect who customized this prefab, designing from a distance is nothing new. Since 2006, his panelized FlatPak homes have shipped all across the United States, from Texas to New Jersey. When the prefab left the factory in Stratford, Wisconsin, in early 2013, it was 95 percent complete. Braving a winter delivery, during which the truck skidded off the icy roads into a snow bank, the payload arrived unscathed and was erected in hours. A single “kiss point” where the two modules meet defines the home’s relationship to its environment, forming a V-shaped breezeway and framing expansive views of the lake.